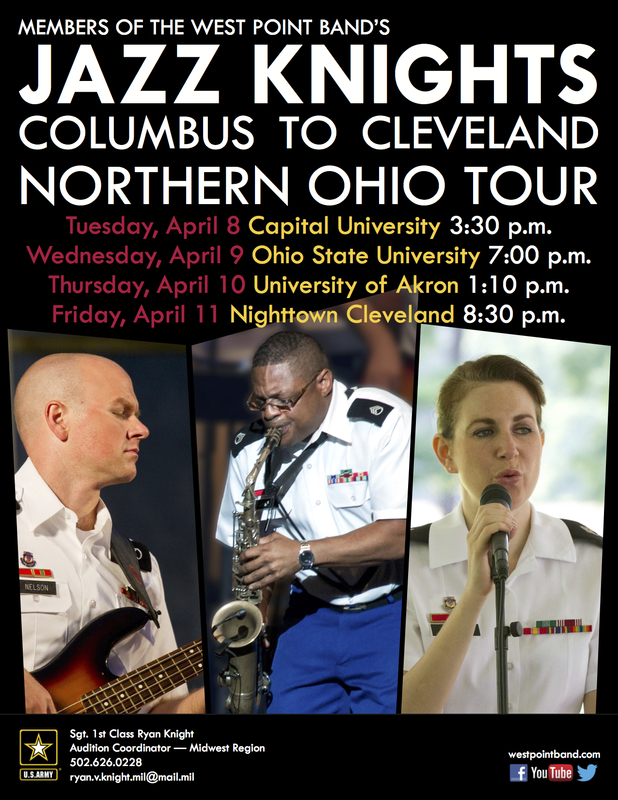 Members of the Jazz Knights will be touring Northern Ohio from Wednesday, April 8th to Saturday, April 12th, with visits to Capital University, Ohio State University, University of Akron, and a free Friday evening performance at the iconic Cleveland jazz spot, Nighttown Cleveland. 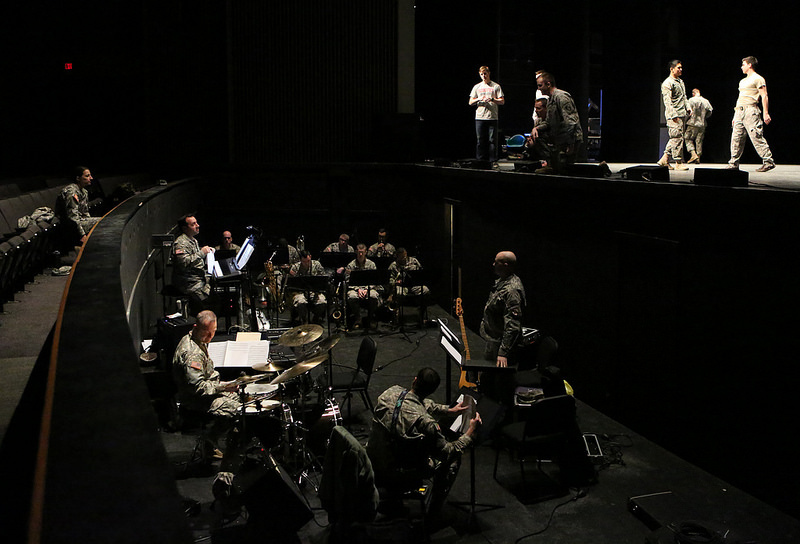 The jazz septet features vocalist Staff Sgt. Alexis Cole and a three-horn front line performing original compositions and arrangements alongside classics from the American songbook and the jazz tradition. 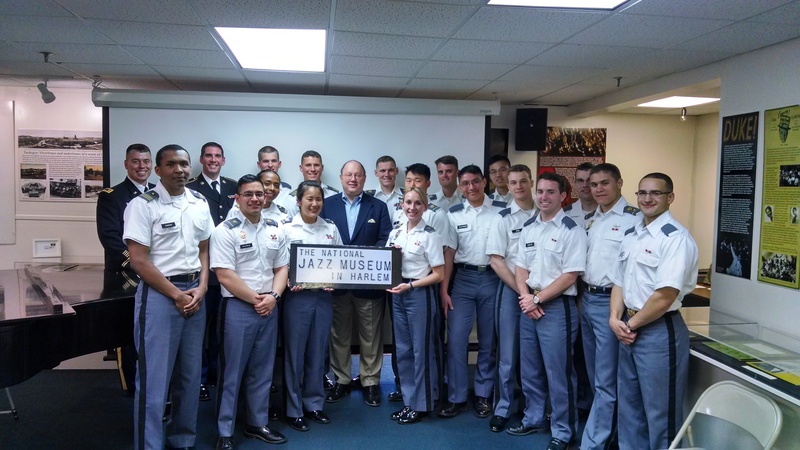 After each university performance, the Jazz Knights will visit with current music students to discuss opportunities in the Army Music Program and their experiences serving our nation as members of the West Point Band. 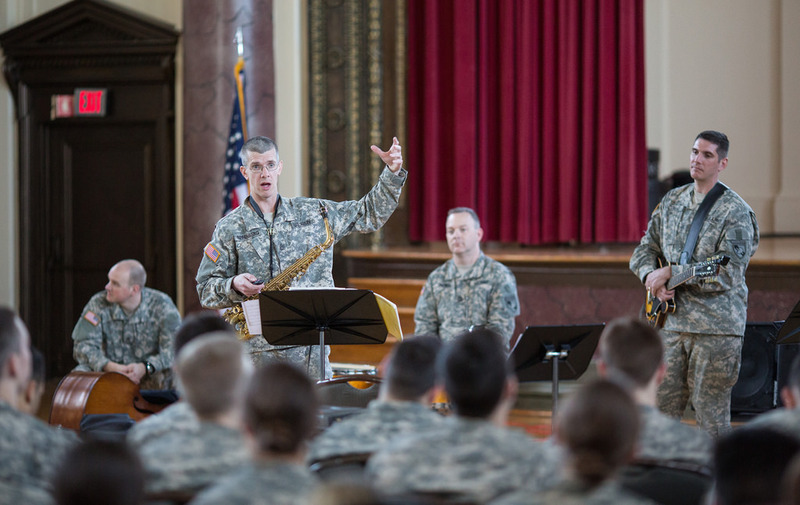 Please visit www.westpointband.com for details on the upcoming performances, and contact U.S. Army Music Program Midwest Region Audition Coordinator Sgt. 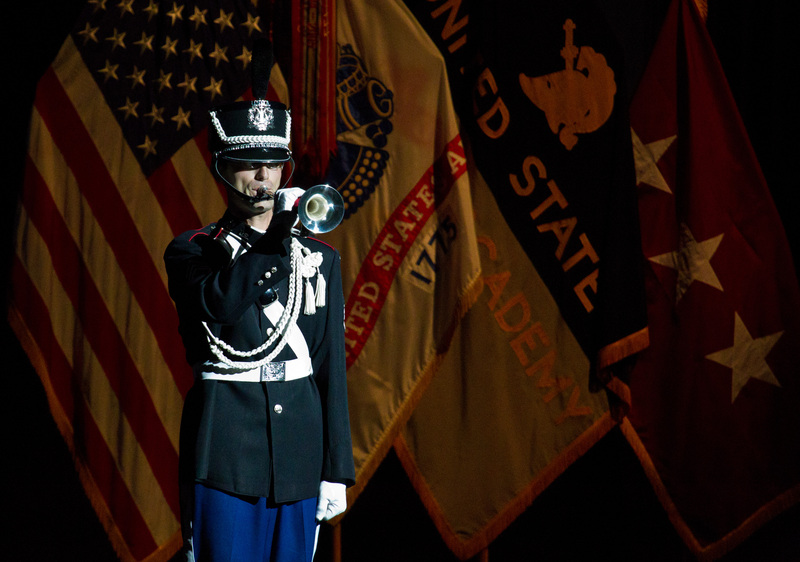 1st Class Ryan Knight if you would like more information on Army Bands. 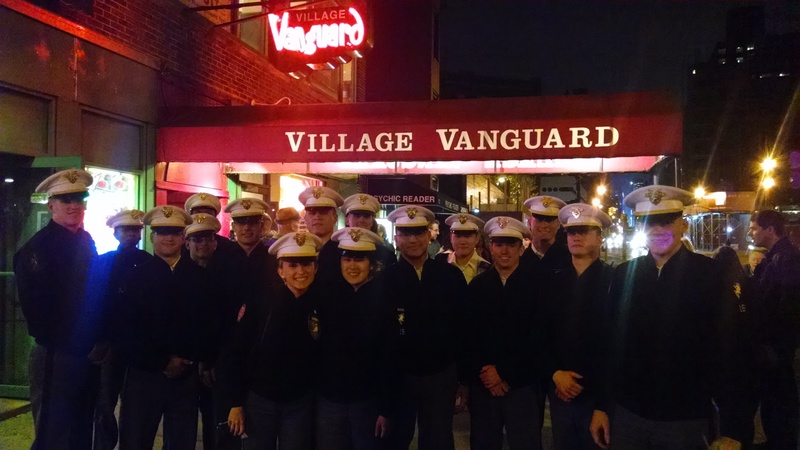 Earlier this month members of the Jazz Knights traveled to the Zenith City of the North, Duluth, Minnesota for the 41st annual Head of the Lakes Jazz Festival at the University of MN-Duluth. 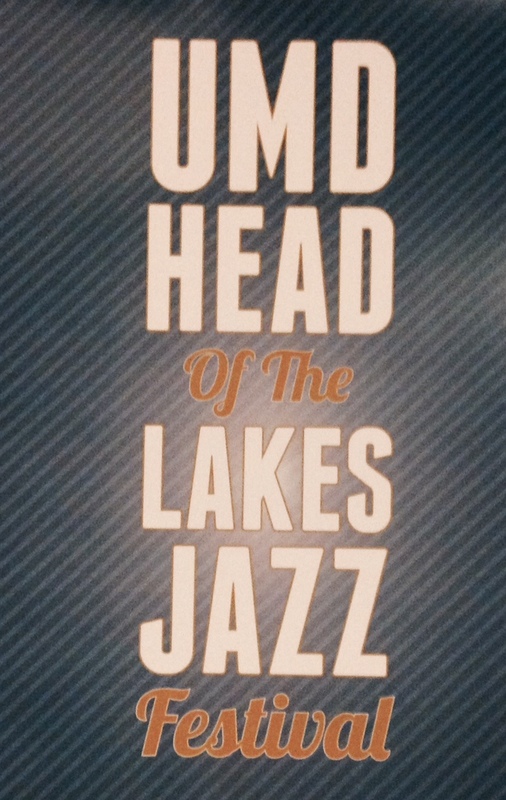 Head of the Lakes is a non-competitive festival, offering positive, learning-based experiences for young jazz ensembles throughout the area. This positive, learning-oriented approach has become a hallmark of the Head of the Lakes Festival. Duluth is in the midst of a cultural boom and overflowing with music, especially jazz and folk. The city is full of all sorts of venues: clubs, hotels, schools, churches and libraries. Not a huge surprise for the city that can lay claim as Bob Dylan’s birthplace. It’s wonderful to see a city with big bands and small groups playing everything from Dixie to Duke Ellington on any night of the week. During the days leading up to the festival, we had the honor of performing for college students and faculty from around the area. 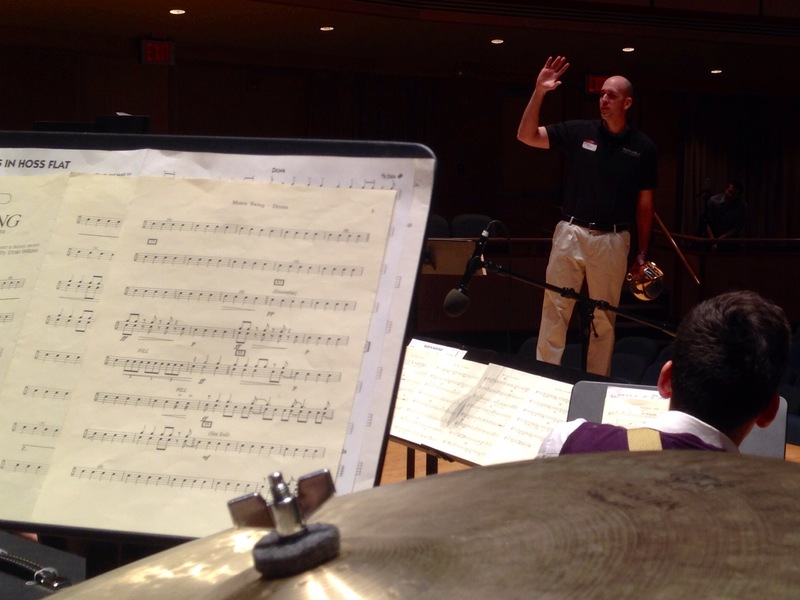 On Thursday we visited the UMD Music Department during their weekly “Recital Hour” and had the opportunity to work with not only the Jazz Studies students that day, but the entire Music Department in their beautiful music hall. UMD Jazz Department Head, Ryan Frane, and everyone on the jazz faculty at UMD is world class and it was a privilege to perform with Adam Booker and Gene Koshinski, the departments jazz bass and drum instructors. 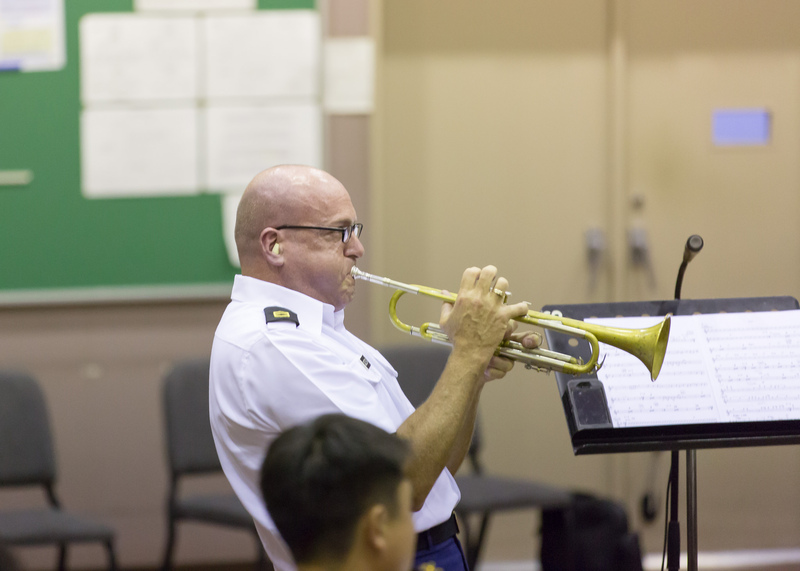 MSG Rich Johnson, a UMD alumni, then gave a trumpet workshop on the challenges of transitioning from school to professional life as a trumpet player and his experiences recovering from a broken embouchure, all the way to earning a position in the West Point Band. It was a enthusiastic discussion about training for quick recovery, adapting to new situations and creating a foundation for a life long career. Friday we crossed over the high bridge, with it’s awe-inspiring view of a frozen Lake Superior, and traveled to the University of Wisonson-Superior to work with Jazz Studies Department head Greg Moore and his UWS big band as they prepare to travel to the Eau Claire Jazz Festival this spring. Dr. Moore is an excellent director and tenor saxophonist, who’s love of the music is clearly evident in his approach to leading a band. 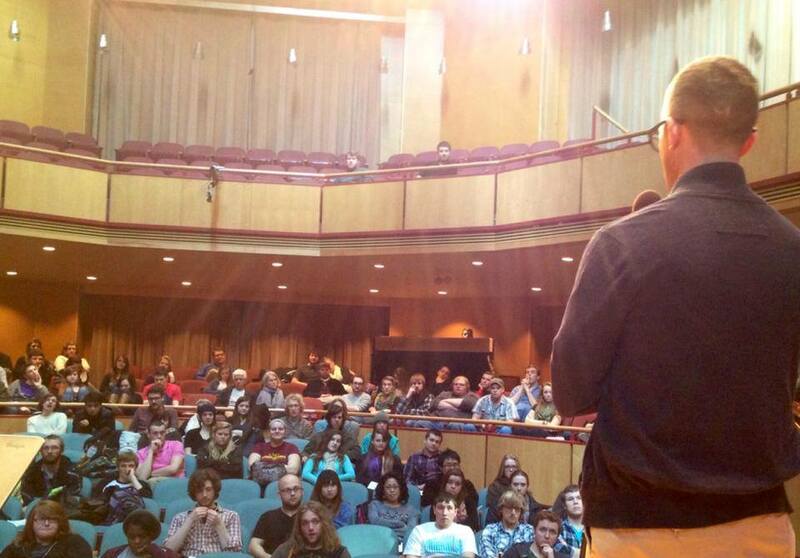 His passion is infectious and the students level of commitment to the music and each other was clearly evident. What a great team! When rehearsal was over we stayed to perform with students in a workshopping session and SFC Dan Pierce led a great discussion about our career field, what it means to be adaptable in today’s job market, and ended with an inspiring talk about personal musical influences and how those led us to where we are today. Earlier that day, we had the chance to visit the Duluth Veterans Memorial on the shores of Lake Superior. 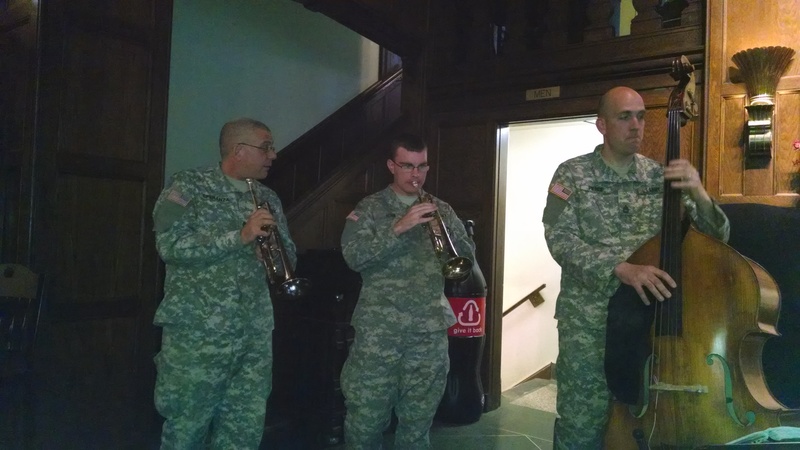 This was especially significant to MSG Johnson, since he had performed Taps for services at the memorial while he was still a music student at UMD. 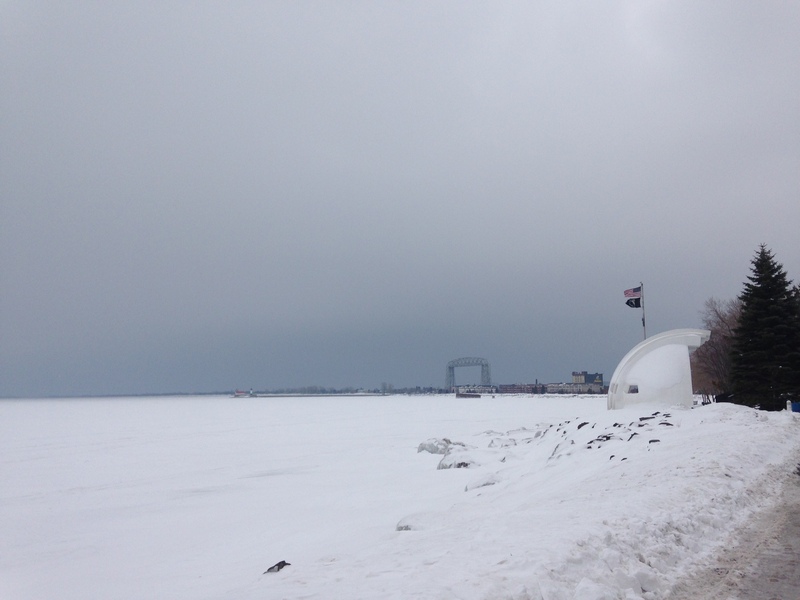 The white, wave inspired monument set against the big lake, frozen over for the first time since 1996 was a moving site and the names of local service members inside the memorial was a powerful reminder of service and sacrifice. Head of the Lakes was in full swing Saturday with high school jazz bands from across Minnesota and Wisconsin. The Jazz Knights spent the day adjudicating big bands with other area professionals and participating in instrument workshops and lectures. Each ensemble received 40 minutes of individualized time that included a performance and evaluation with adjudicators. It was inspiring to work with such talented and motivated students, everyone came ready to play and they all performed at the top of their various levels. 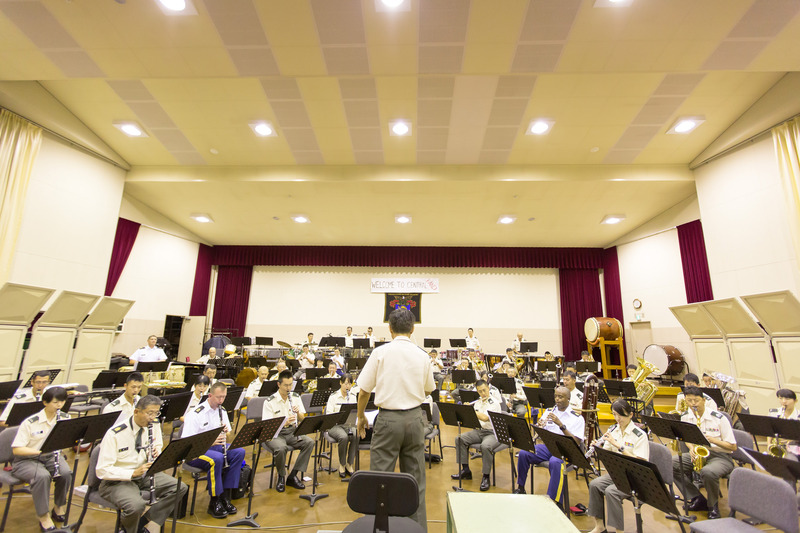 Being able to really dig into the music with them and discuss specific details that will take them to the next level was very rewarding for both us and the students. After the last chorus was played and the instruments were packed up, we were able to work with and perform for over 1000 area students and audience members. 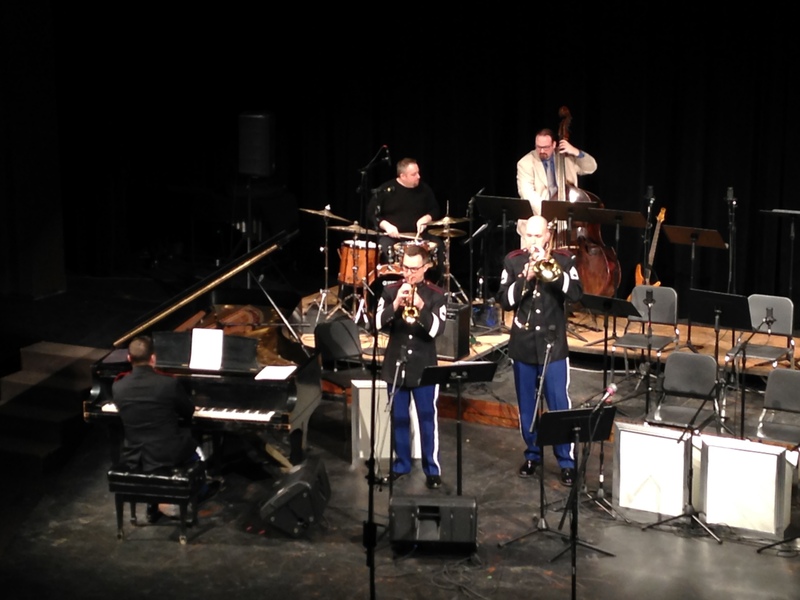 Jazz is alive and well in Duluth and it was an honor to share our Army experiences with such a dedicated community. Great People on a Great Lake! In December of 1860, the Dialectic Society gave an “entertainment” entitled “Toodles.” This forerunner of the 100th Night Show included two farces, a few dances, poetry and dramatic readings. 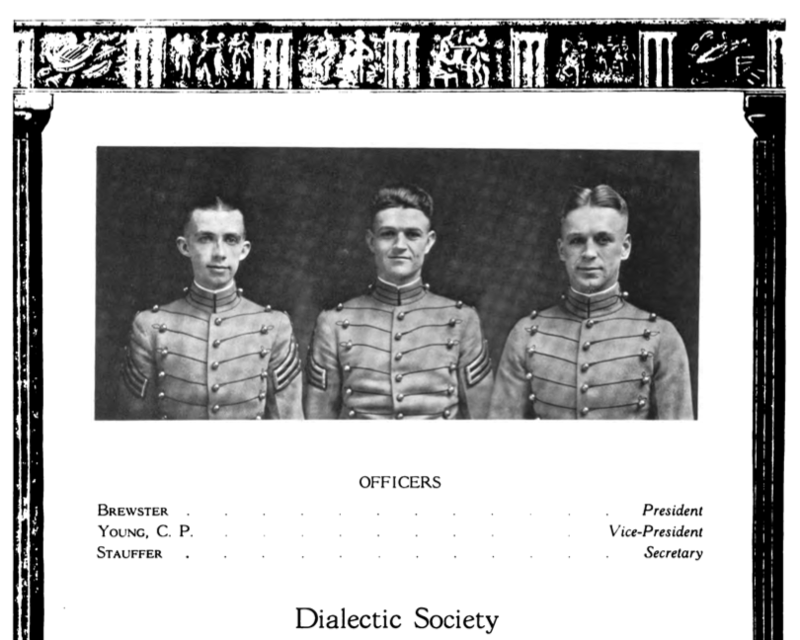 During these years, before movies and television, amateur theater and musicales were often the only entertainment available to officers and families at West Point and these shows became a welcome part of life at West Point. 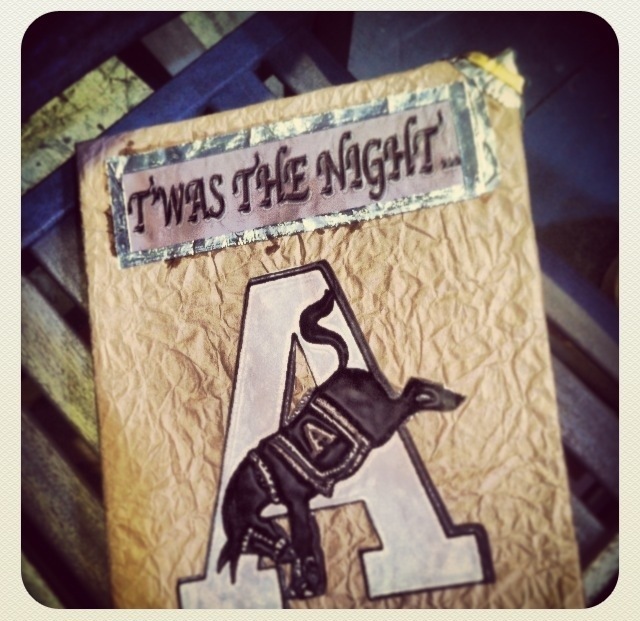 The first “100th Night Show” was a collection of skits presented by the First Class in 1871. The “Nineteenth Century Brevities” was performed in the Mess Hall, and resembled an English recitation more than anything else. By the late 1800’s the show moved to Grant Hall and was earning write ups in the New York Times. People began traveling all the way from the city to see the festivities. 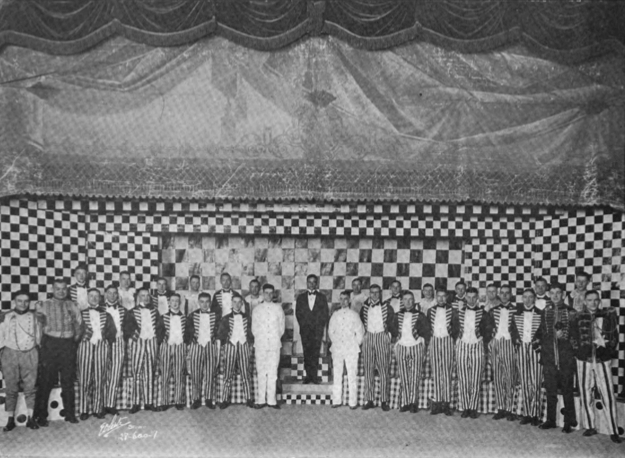 By 1902 the show found itself a proper stage in Cullum Hall, still used today for Cadet Hops with the Benny Havens Band. The next year the first full-length musical comedy, “The Caprices of Cupid” was staged by the Class of 1903 and ever since the “100th Night Show” has been a musical comedy. During the 1940’s and 50’s Academy Award winning lyricists like Sammy Cahn would take time off from writing lyrics for Frank Sinatra to work with Cadets crafting the next big 100th Night hit. 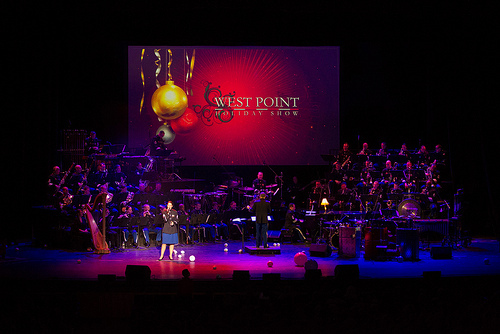 The story is not complete without mentioning the West Point Band’s “100th Night Show Orchestra” under the baton of SGM Scott Arcangel this year. 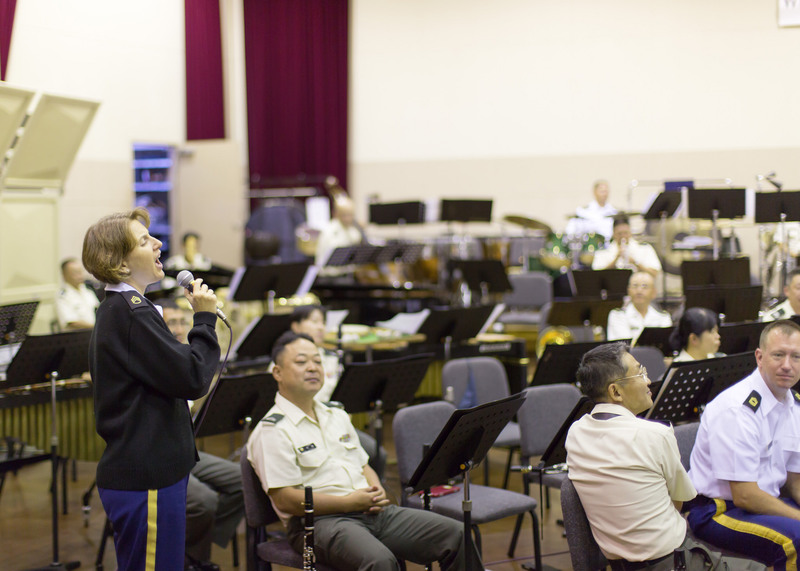 The orchestra has always been built from members of the West Point Band and resembles a standard Broadway pit orchestra. 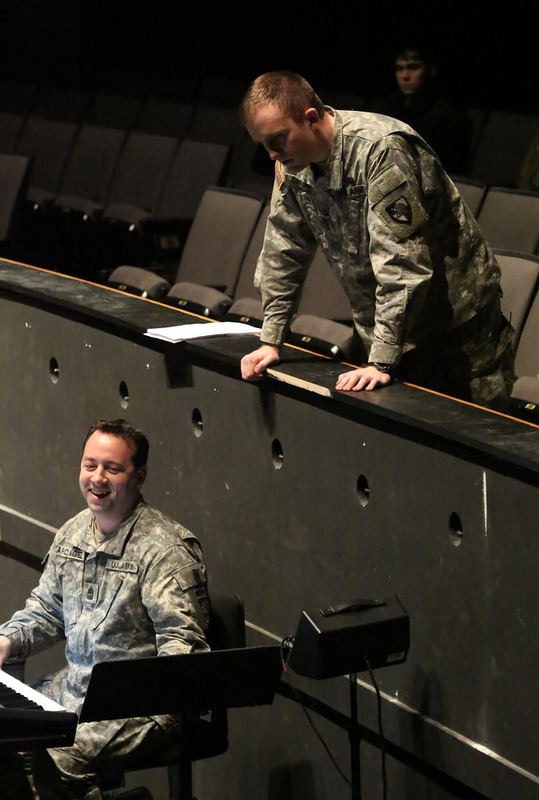 For this years show SFC Mike Reifenberg has worked closely with Cadets for months, composing a full book of completely original music that covers everything from Broadway show tunes to Green Day-death-metal-rock. 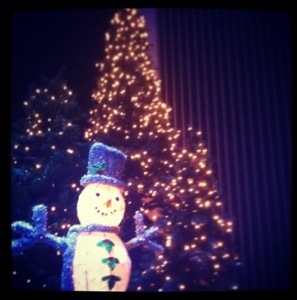 This is the story of the 100th Night Show. You probably won’t hear many of the songs played again after the show, but we guarantee that you will be whistling at least a couple of them in the weeks to come.